For all types of electrical waste. KeyWaste offer a complete collection, management and recycling service for all types of electrical waste. This service provides clients with a safe, secure and compliant recycling programme for redundant electrical waste. Free assessment and cost estimate. Collection of white goods including fridge freezers. 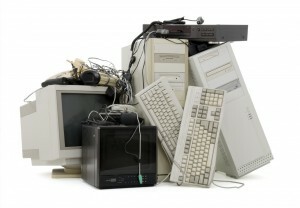 Collection and recycling of redundant IT and office equipment including CRT monitors. We provide certificates of destruction as required. Scheduled WEEE collection, includes the provision of a disposal cage to contain redundant IT equipment and an agreed scheduled service. We also provide a full data destruction service for hard drives, cassettes tapes, floppy disks, etc. A certificate of destruction is provided when items are destroyed.